When we hear of mudra we generally know what it means: a particular hand gesture of a Buddha or a bodhisattva. Such a mudra is often a key to recognising which Buddha image or sculpture is before us. Especially Amitābha Buddha shows a somewhat larger number of mudra, that are furthermore specifically his, and that we - exception given - don't see on other Buddha images. The 20th, and beginning of the 21rst Cent. have seen an increasing interest in so-called mándala, semi-abstract sand-paintings made by Himalayan lamas, and destroyed as soon as they are ready, so as not to let the wish to keep them for ever and ever arise. These mándala are respresentations of the universe, from the coarse on the outer rim to Buddhahood in the center. These sand mándala are but a section of what has come to be known under this name, and they're just as popular among the Tibetans as among the Buddhist esoteric traditions of Japan, and even among the Pure Land believers of that country. When the Japanese Buddhists speak of the Pure Land Mándala, they refer to a representation of Amitābha's, or Amida's, Pure Land: Sukhāvati, which in Japanese is called jodohen. 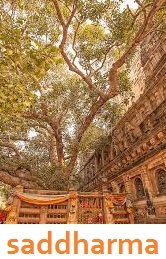 This land is depicted with all the beings, that is, the nine grades of rebirth, attending the teaching Buddha. The gesture, i.e. 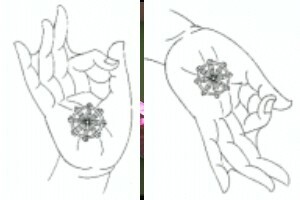 the mudra of teaching is traditionally depicted in two slightly different forms, as you will see below. The Juhakka-in on Mt. Koya has a triptych showing a typical raigo. A raigo is a depiction of Amida Buddha and his host of attendants descending in welcoming and guiding the dying to the Pure Land. The center panel has a jodohen (see above) of Amida Buddha showing a teaching mudra that is generally used when commissioner and artist wish to set your mind in the direction of The Larger Sukhāvatīvyūha Sūtra, one of the three sūtra, or Scriptures, belonging to the Japanese Pure Land Tradition. This Pure Land Tradition has three branches; one does not manifest itself outside Japan, one is called the Jodo Shu, another is the Jodo Shinshu. Furthermore, both the Tendai and the Shingon traditions have each a slightly similar teaching concerning Amida Buddha, although they do not include the three Pure Land Sūtra. The Lotus Sūtra as interpreted by the Nichiren traditions has the name of Amitāyus (Amitābha) amidst the description of a host of Buddhas and their Pure Lands. One of the representations of Amida in Taima-dera refers to the same collection of sūtra concerning Amida Buddha. The mudra is basically identical to the one shown above. The difference here is that the hands are wider apart. The Taima mándala as it is called, is a jodohen as seen above, that is, Amida Buddha teaching in his Pure Land. The webbing in the palm of the hand shows the Dharma Wheel as is described in the traditional list of thirty-two characteristics of a Great Being, a Buddha. The raigo, the Descent of Amida Buddha and his host in welcoming and guiding the dying to his Pure Land is specific for the Pure Land tradition, both in Japan and in China. The above pictures shows such a raigo representation. The sūtra concerning Amida Buddha describes in rather detail the nine grades of Rebirth in the Pure Land. These nine grades indicate the lenght of time one has to cultivate in this Land before reaching full Buddhahood. Whether an individual will stay long or short in this Land, it is said, can be judged from the deathbed vision. The dying can have a vision of a full raigo, or of a lotus in which he or she will be reborn, or of nothing at all. Each one of them, provided the cultivation on Amida was sincere, will reach the Pure Land. But those who see a full raigo will have certainty that Buddhahood is within reach. Many families, therefore, have a raigo somewhere around the house. They look at it ever so often. However, the two founders of the Japanese Pure Land tradition, Hōnen (1132-1212) and Shinran (1173-1262) had different views on the raigo-concept. Where the longing for a Pure land rebirth is described as a "radical dualism" (zettai-teki-nigenron) by Tamura Yoshirō, he also maintains that this radical dualism was the strongest in Hōnen. Ruben L.F.Habito (Originary Enlightenment, Tokyo, 1996) summarizes Tamura's stand as follows: "In contrast to Hōnen's other-worldly piety, his disciple Shinran, ...., and his de-emphasis on the attitude of expecting the Pure Land in the after-life (raigo-shisō) is pointed out as a stance affirmative of this world (genjitsu-kōtei)." Furthermore, a Pure Land teacher who should have been one of the first "breakaways" from the monastic traditions, Myozen (11th cent?) left a short note in which he muses on "birth", that is, the moment when Buddha's Other Power takes over and sweeps the devotee into the state of enlightenment. He says; "When I reflect on having met with the effective cause of birth, Other Power, I realize that it is with this life that I must gain liberation from birth-and-death. ..." Clearly, Myozen doubted the theory that "birth" is for the deathbed-experience alone. The mudra in a raigo are specific for this particular description of events. The picture shows how Buddha here has his left hand in the meditation position, with palm upward, and the right hand stretched alongside the body with the palm outward in the welcoming gesture. This gesture is called the varada mudra in Sanskrit. On these mudra the Japanese and the Chinese traditions basically agree. The Jodo Shinsu tradition is more specific in its depiction of the raigo mudra, here we see the raised right hand in the teaching gesture. The left hand shows the active conversational mudra. Here too you see the webbing in both hands showing the Dharma Wheel. The most famous mudra of Amida is seen on the so-called Nara Buddha, a statue that is the center of attraction in the city of Nara. 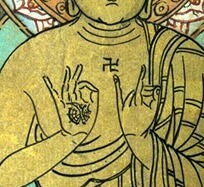 The mudra is seen on no other representation than Amida Buddha's. It signifies a meditation in which all the psychic power is assembled in one particular place in the abdomen, just below the navel, between spine and belly. This posture is called samāhitā. Whatever Buddha statue or image has it, depicts Amida or Amitābha Buddha. Basically the artist delved into the daoïst philosophy in depicting this mudra. The classical daoïst meditation tries to gather in the inner energies at one particular place, the area around the navel to then wait until it "consolidates into a single seed of Golden Grain." 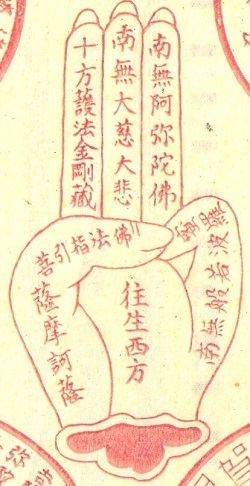 The passage in-between brackets is from the Can Tong Qi, a daoïst work that stands on the crossroads between outer alchemy (the making of gold out of inferior matter), and the inner alchemy (strenghtening the inner self). It is higly unlikely that the emperor who ordered this statue of Amida to be made included this daoïst principle in his brief; we must assume that the statue maker tried to make his master happy by coming up with something totally new and unexpected. The hands in this mudra are folded in such a way that thumbs touch, and fingers are folded upward, equally touching. In some instances all fingers are folded as shown here, in some other instances, such as in the Amida Buddha of Byodo-in, the hands are placed the one on top of the other, palms upward, and only the indexes are folded in the way shown above. Before the coffin is closed monks and or nuns in the Chinese traditions who use the cultivation on Amitābha and his Pure Land, recite the Amitāyurdhyāna Sūtra, the Sutra on the Meditation on Amitāyus (Amitābha), plus a number of incantations and mantra relevant to reaching the Pure Land. The coffin in the funeral furnace or in the burial mound will, at the moment of cremation or burial, be covered with a printed mándala, a series of texts grouped in concentric circles and a hand with three raised fingers. This practice is used by the orthodox communities. A refuge throughout the ten directions, a dharmic protection, a strong base (Sheh Fang, Chu Fa, Chi Kang, Kuei). This tradition is purely Chinese. Part of a Dutch language site on Sutras and Shastras.